....but I still love to see things in order, harmonious, and very pretty. I dont ever say I'm a decorator, yet everything I do involves decorating. I even decorate myself. What I'm finding in the blogging world of gorgeous blogs, is that many women are decorators, but they are also more.....they are mothers, women, doctors, wives, sisters, aunts, grandmothers, psychiatrists, psychologists, cooks, lovers, healers, ..........I could go on forever, but the point is women who call themselves decorators are also much much more, I'm finding.....and also to my great relief. their creativity and ingenuity know no bounds, and I stand in awe of this. I thought I was good LOL....and I am, but there are many others out there who are masters, and because of this masterful ability, I have been inspired, and the ''decorating'' women in blogland have helped me to change my life, and bring me up to the octave of better living I have been wanting. Because I've been so inspired by the pictures so well taken by these amazing women many of whom are also awesome photographers, I decided to wait no longer. I have spoken with my roommate about this and he's all for it because he basically doesn't care anyway, and he spends 90% of his time outside in the garden by the pond, or asleep. He works hard at the Whole Foods Market so when he does get home all he wants is peace and quiet. Fine with me, that's what I want too. I take care of the house and the property because he basically cannot....so I do it. Only now, instead of living in the ''temporary'' state as I have been, and my own plans not working out, as I'm still in this house, I decided to make this house as if it were my own. Which means improvements all around, nothing major of course, no construction or deconstruction but removing that which is not absolutely loved and beautiful and replacing it with that which is loved and beautiful...no more temporary fix ups or ''just for now'' decor. So my first endeavor is finally, a chandelier. I've always wanted one because I love crystals, and elegance and beautiful lighting. And while I normally do not like overhead lighting, this chandelier is going to hang low over the kitchen table. All the lighting in this house was not my choosing, and I don't use it, I only use the light of day from the windows, and candles or Himalayan Salt Crystal lamps lamps which I went nuts for years ago and have quite a collection. It is beautiful, they glow so much and I love their energy. But in my search for crystal chandeliers, I was first put off by the high prices, and I know crystal doesn't have to be expensive....yet the chandeliers that are beautiful were pricey. I got dismayed thinking I may not have one soon. But I kept looking and googling and looking in images and reading comments and bloggers and I could see many people found chandeliers for very cheap and one even as cheap as $1.00, that is one dollar! I thought I may have the same luck but it would involve many many hours, and days of thrift shopping which I do not like to do. This week again, wanting terribly some shabby chic chandeliers, I got online again late in the night and looked at images and found one picture that led to a commenter giving the website of affordable crystal chandeliers with real crystal too.....the only thing is they require assembly. I was happy, because I found 5 that I really like in the mini chandelier section all for less than $100.00 and my roommate helped me choose one since he has to look at it too and I'm glad I asked because he found one ''spooky''. don't ask me. LOL. This is the one I ordered and it is all crystal and 17" by 17" with 4 lights. I'm hoping my roommate can put a dimmer switch on it so I can use it as a gentle nightlight. isn't it gorgeous? It will help to create the feel I want to see everywhere around me which is of Beauty, and thusly, I will be in a mindspace to create and be inspired more often. This is when the Magic truly happens and I know that it is critical for my space to be just right for me to feel 'set' and ready to enter the magical inner landscapes that are so inspiring, that I can feel the purpose of my soul. And this is only the beginning. I'm also working on the gardens, and cleaning out and clearing out things that are not the best. The other thing is that I am hopelessly frugal, and 'green' minded. I do not like waste at all, nor to spend lots of money on anything as I do not believe quality has to cost alot, it doesn't, and I don't like to create waste as in garbage, I recylcle, redesign, redisignate, or give away. My next ideas are for the kitchen. In my thrift shopping yesterday, Saturday, yes I did go into those stores, and while I initially was not impressed and I do not like the smell of used clothes, I do see many things in glassware that can be used and I have them in mind for when the need arises. I could not believe how crowded the stores were! But I found in the last store I went into, as I was swearing that I'd never ever go into another thrift store in this area again..... I forced myself to look to see if there is legitimacy in finding treasures in these stores, and yes there was. I found some beautiful silver placed candle holders very ornate which I think I'll have to go back for. 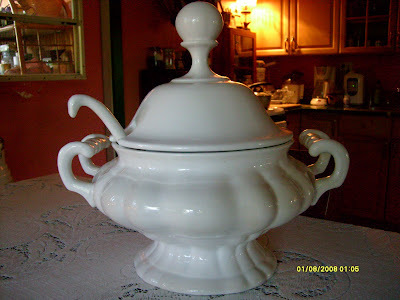 But the treasure I found was my white soup tureen. I glanced up for some reason, and there was this large gorgeous gracefully shaped elegant white porcelain soup tureen made in Portugal in perfect condition, almost looking unused for $15.00. I think now, I can begin to collect a white servingware which I have been admiring on so many blogs, and I just happen to find some beauties a few days ago in Home Goods for good prices. For $40.00 I should be able to pick up a set for 4 people. They are beautiful. But then...I'll also need a place to put them as this little cottage is small and the kitchen doesn't have space. But I decided to get a dish rack to put over the stove and remove the basket that is there ''just for now'' and which you can barely see in the picture above as the stove is behind the tureen :D ....and put a pretty dish rack and my new white dishwares. Finally I'll have a serving set for 4 people. After I did all that browsing in 4 thrift stores, my neighbor came by and I told her of my new ventures, and she asked if I wanted to go to the antique mall she told me about, and I said yes! like a crazy woman. We went and they were actually very nice like ones I remember in New York and Pennsylvania. I found some things I could use, and yes I did check for crystal chandeliers in all the stores, and they were all over $200.00....not for me. I do need another one, but this time I want to spend all of ten dollars, even if I have to fix it up myself. Ok, alot was said in this one and maybe it should have been 3 separate posts, but I'm not too fond of posting so much or saying so much, so this is the moments expression. Suffice to say, this Path of Beauty which I have always walked, but which I am now taking up to another octave, is one of sheer pleasure. I also feel a softness from the ''Universe'' who seems to support me in this decision. Another quest I am on....and another post........is LACE, LACE AND MORE LACE......ANY ADVISE PLEASE DO CONTACT ME! Oh my gosh I love that soup turene...wondeful post too!